E-R Model is not SQL-based. It's not tied to any particular DBMS. It is a conceptual and semantic model, which attempts to capture meanings rather than an actual implementation. DO NOT THINK TABLES--YOU WILL BE MISGUIDED. We often just say "entity" and mean "entity type"
May be derived – a virtual attribute, one that is computable from existing data in the database, use dashed oval. This helps reduce redundancy. Domain: possible values of an attribute. Primary key: the candidate key chosen to be used for identifying entities and accessing records. Unless otherwise noted "key" means "primary key"
Foreign key: term used in relational databases (but not in the E-R model) for an attribute that is the primary key of another table and is used to establish a relationship with that table where it appears as an attribute also. So a foreign key value occurs in the table and again in the other table. This conflicts with the idea that a value is stored only once; however, the idea that a fact is stored once is not undermined. Dashed ellipses-- derived attribute, e.g. age is derivable from birthdate and current date. "John" majors in "Computer Science"
Student (entity type) is related to Department (entity type) by MajorsIn (relationship type). 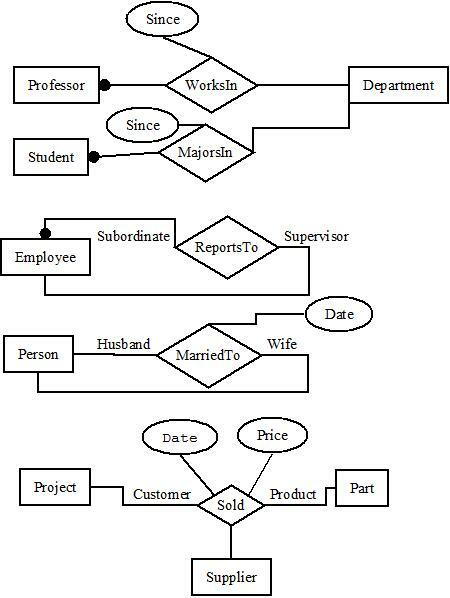 Relationship Types may also have attributes in the E-R model. When they are mapped to the relational model, the attributes become part of the relation. Represented by a diamond on E-R diagram. time stamps of updates or establishment of a relationship between two entities can be attributed here rather than with the entities. The role of a relationship type names one of the related entities. The name of the entity is usually the role name. We do not have distinct names for the roles. It is not clear who reports to whom. Roles are edges labeled with role names (omitted if role name = name of entity set). Most attributes have been omitted. i.e., "student" "majors in " "department"
Here we have equate the role name (Student) the name of the entity type (Student) of the participant in the relationship. Ternary – links three entity sets; ordered triples (rare). If a relationship exists among the three entities, all three must be present. This is rare. NOTE: Ternary relationships are rare. N-ary – links n entity sets; ordered n-tuples (extremely rare). If a relationship exists among the entities, then all must be present. Cannot represesnt subsets. Note: ternary relationships may sometimes be replaced by two or more binary relationships (see book Figures 3.5 and 3.13). Semantic equivalence between ternary relationships and two binary ones are not necessarily the same. 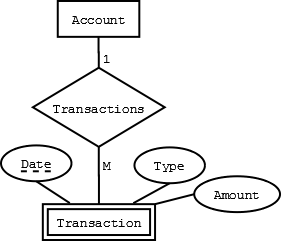 Cardinality is the number of entity instances to which another entity set can map under the relationship. This does not reflect a requirement that an entity has to participate in a relationship. Participation is another concept. One-to-one: X-Y is 1:1 when each entity in X is associated with at most one entity in Y, and each entity in Y is associated with at most one entity in X.
One-to-many: X-Y is 1:M when each entity in X can be associated with many entities in Y, but each entity in Y is associated with at most one entity in X. Of these choices, please use the first method! E.g., A Class entity cannot exist unless related to a Faculty member entity in this example, not necessarily at Juniata. In a relational model we will use the references clause. 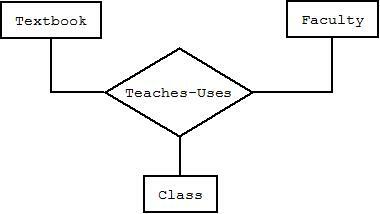 E.g., if a class is taught by only one faculty member. 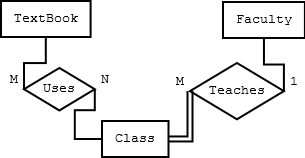 E.g., A Textbook entity can exist without being related to a Class or vice versa. 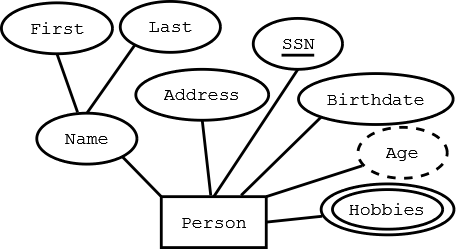 Attribute names, Aj, and their corresponding domains. Attributes in the E-R model may be set or multi-valued. This was produced with Dia. It is the same as the figure in the book using instructor's preferred style.